HEHEHEHE, you like that picture way better don't you? Look, let's cut to the chase. I know I adore things like cold stone and B&J, but that doesn't mean I've lost all appreciation for a simple $1.49 treat. Overall, it was a fun little treat to mellow me out before the ride home. That said, let's talk specifics. Now there are two things that stand out with this treat. The first is the apple bits. Not only are they the perfect size, but this smaller (yet respectable) size means there are enough to last through the entire treat. How often does that happen? Second, I was surprised how the apple clamped down the flavor of the caramel. 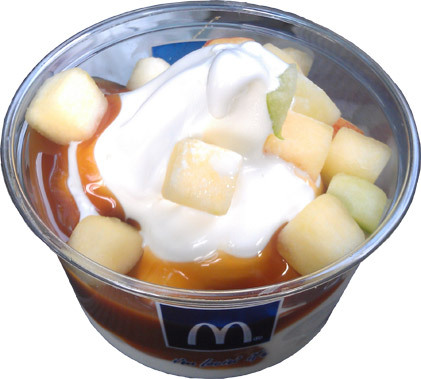 It's not like McD's caramel is super potent, but it's definitely running 2nd to the apples here. You may get a bit of caramel at first, but as soon as you start chewing the apples, that becomes the focus. At no point did I think that it was too sweet. 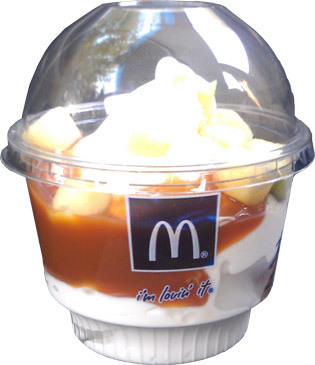 The real question is: do I really like apples in my caramel sundae? I'm going to have to sleep on it. This is definitely good enough for everyone to try, and then make up your own mind if you prefer this or the regular sundae. Oh, and don't be put off by the smaller size. Even though I could have gone for more (I scraped my bowl clean), the truth is it was the perfect amount, at least for me anyway. Note 1: Marvo's apples aren't cubed, maybe it's a regional thing? Note 2: Yes, I will try the Wendy's one for comparison in the near future --- TRIED! I also read Marvo's review and although I haven't had a McD's sundae in forever had to try one. Stopped today at our local McD's in S. Jersey and we don't have it yet. I thought this was nationwide. Maybe not. To make you feel (a smidge) better: even though I could see this new treat on the menu, I still had to wait 30 seconds while the server asked if they actually had it. Just wait another day or two and you should be good to go. Went to get a Carmel Apple Sundae in the Lawrenceville, New Jersey McDonalds today, the girl looked at me like I had three heads, she never heard of it and it's September 19th and I see the commercial every day.